Plantar fasciitis refers to inflammation of the plantar fascia of the foot. It is a common condition and can be unilateral or bilateral (however, any bilateral presentation suggests a systemic cause). It is the most common cause of infracalcaneal pain and accounts for 80% of heel pain complaints. It has an estimated prevalence of 10% and is most common between the ages of 40-60 years old. In this article, we shall look at the pathophysiology, clinical features and management of plantar fasciitis. The plantar fascia is a thick fibrous band of connective tissue originating from the medial process of calcaneal tuberosity. It extends towards the forefoot and inserts at each of the proximal phalanges. Individuals may be predisposed to the condition from the anatomical structure of the foot. During the gait cycle, the hallux is dorsiflexed and the plantar fascia is forced to shorten and elevate the medial longitudinal arch; any anatomical abnormality to the foot can result in an asymmetric loading on the plantar fascia – leading to chronic repeated damage. Patients will report sharp pain across the plantar aspect of the foot. It is often felt most severely in the heel and can radiate down the arch distally. Classically it tends to be worst with the first few steps of the day or after periods of inactivity, before easing off. On examination, assess for evidence of over-pronation, high arches, leg length discrepancy, or femoral anteversion (all of which can predispose to the plantar fasciitis). The infracalcaneal region is commonly tender on palpation and palpating the medial calcaneal tubercle can reproduce the symptoms. Important differentials to consider include achilles tendonitis, Morton neuroma, calcaneal stress fracture, or inflammatory arthropathy. Plantar fasciitis is a clinical diagnosis, hence further investigations are only performed if the diagnosis is in doubt. Plain radiographs can be done to exclude bony injury (if there has been a history of trauma) and to assess for a plantar heel spur* (which can indicate an abnormal loading of the plantar fascia). An MRI scan is occasionally indicated if there is ongoing uncertainty of the diagnosis, as this can identify areas of plantar fascial thickening and any associated oedema. *Only around 50% of symptomatic patients have a heel spur on radiograph. 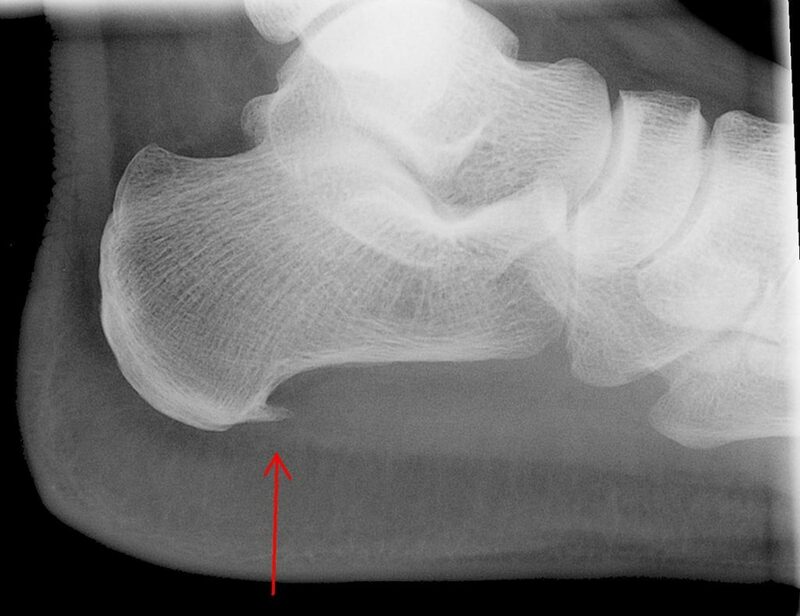 Figure 1 – Foot X-Ray in patient with plantar fasciitis. Bony spur denoted with an arrow. Activity moderation and regular analgesics (typically non-steroid anti-inflammatories) forms the mainstay of management. Footwear should be adjusted, providing a shoe with a well-cushioned heel and a sturdy mid-sole (orthotics can provide additional arch support where required). Physiotherapy is often useful, especially when the underlying cause is muscle tightness or imbalance, and a stretching programme can be provided – often focusing on calf stretches and passive extension of the toes. Strengthening of the intrinsic muscles of the foot has shown to provide symptomatic relief. Corticosteroid injections can be trialed if no improvement to initial conservative management; this can have good temporary effects, but does not always resolve the problem long term. If this provides no improvement, a plantar fasciotomy can be considered. This is an endoscopic procedure whereby part of or all of the fascia is released. This has around a 75% success rate in reducing pain, however it can result in some instability of the medial column of the foot. The recovery from plantar fasciitis is generally very good as symptoms usually resolve following conservative management techniques.